The influence that CO2 has on AGT can be calculated by including ‘C’ in Equation (1) of Reference 2 as a coefficient to be determined. The tiny increase in R2 demonstrates that consideration of change to the CO2 level has no significant influence on AGT. The coefficients and resulting R2 are given in Table 1. 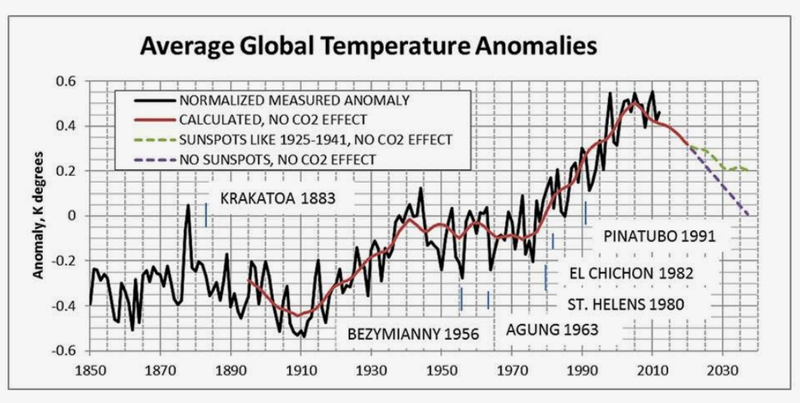 If we ignore CO2, temperatures can be well predicted by sunspots alone. Is this from a peer reviewed science journal? Is your reply a "false argument" of appeal to authority? Why not review the data in the link provided? Why not review the actual temperature data? Let me know your determination and any further questions. Is jzf from a peer reviewed science journal? Unlike peer-reviewed silence, there was no profit motive involved in it's creation, in my humble opinion. Do note his formula, and how closely it relates with real data. Quote of Dan Pangburn: "The physics of thermalization explains why non-condensing ghg change has no significant effect on climate." H20 regularly changes phase change near the triple point for protiated water. Water vapor seems a media more apt to both capture & transfer kinetic energy. Common sense never sees peer review, and perhaps even vice-versa. The two factors that accurately explain the last 300+ years of climate change are also identified in a peer reviewed paper published in Energy and Environment, vol. 25, No. 8, 1455-1471. Dan, thanks for pinging in here. Your work is invaluable. it is hard to get people to open their eyes when they have been lied to for so many years. Dan can you provide a non pay site link to the article you reference? I couldn't find any. The paper at the agwunveiled link with references has about the same information plus everything after Table 1.